I had long heard about the complex historical background regarding the birth of New Zealand so I thought it to be fair and respectful to a country you visit to find out a bit more about their history and heritage. New Zealand is a melting pot of cultures. I read the Lonely Planet several times and wherever I look I keep finding references to the strong Maori population and the Polynesian cultural influences. It does not take long for me to be fully immersed in a truly multi-cultural nation, something that, as an expat, it’s not hard to understand. 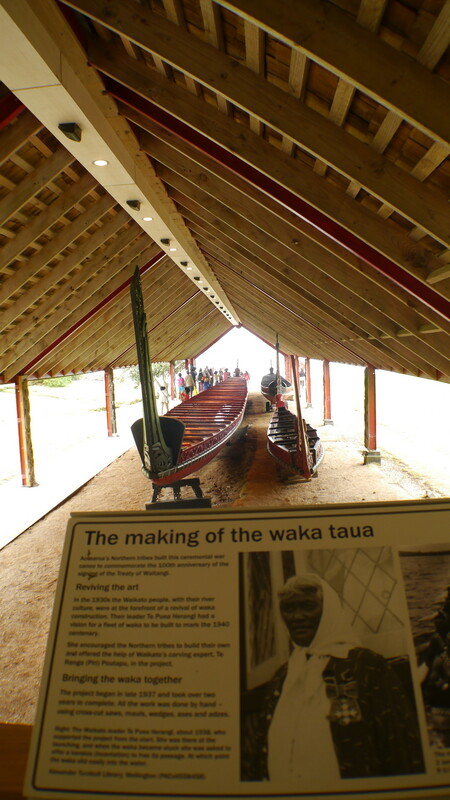 From Paihia, gateway to the Bay of Islands, you can take a short drive to Waitangi Grounds, the place where the Treaty of the same name was first signed by the Crown and the Maori Chiefs. When you walk into the grounds you are greeted by a traditionally dressed Maori couple wearing thick feather capes. A large glass panel illustrating the treaty hangs from the ceiling above. The center offers guided tours, cultural performances and the opportunity to watch a documentary video explaining the historical importance of the place and the disputes arising from the treaty’s inaccurate translation. The issue with New Zealand’s birth is relatively easy to explain but hard to fathom. 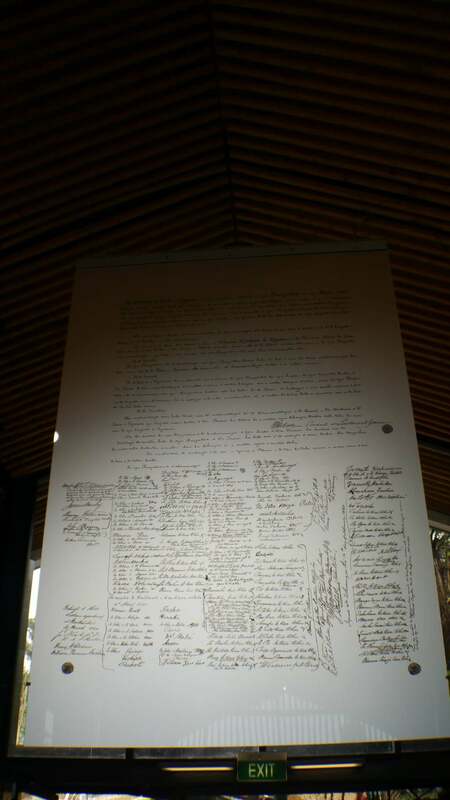 The Waitangi Treaty which brought peace and established the rules of the game was written in English and imperfectly translated into the local Maori language. Whereas the Maori Chiefs thought they were maintaining control over their affaires and their land in exchange for protection (even from each other) from the Crown, the British version states that the Governor has the right to govern over New Zealand and that the Crown has sovereignty over the entire country. Therefore, when you read the treaty, there is no exact agreement as to what was agreed. Waitangi Day, on the 6th of February, still remains New Zealand’s National Day although with mixed feelings. On that day in 1840 around 43 chiefs signed the treaty which was eventually signed by over 500 across the country. The video at the beginning of the visit is well worth a watch to better understand the circumstances of the country’s birth and the subsequent breaches by the Crown, the various disputes and today’s ongoing tribunal. To better understand what went on on that day, there is a YouTube movie that explains it in detail. The British Queen is said to have signed only one assent herself, the one which acknowledged the injustices suffered by the Maori with regards to land confiscations. Although the Treaty was generally ignored until the 1960s since then, the Maori started to call for some parts of the Treaty having been breached by the Crown. In 1975 a Tribunal was created to handle those complaints. It is ironic that the Treaty was seen by the Maori and the British of the time to serve as a way to bring peace and justice to a largely lawless area which had become a source of fights, battles and confrontation as a result of the British population which had arrived in large numbers. Runaway convicts, sailors and whalers congregating in and around the Bay of Islands were bringing with them the lack of respect for the law and increasing the risk of war. This also brought with it the weapons and fights among the Maori Chiefs so the signing of the Treaty was seen as a way to agree on the Crown using its power to protect the citizens, Maori included. Unfortunately, decades later there are still disputes and disagreements generated by the Treaty that are still being resolved. If you are around the area it is well worth a visit. 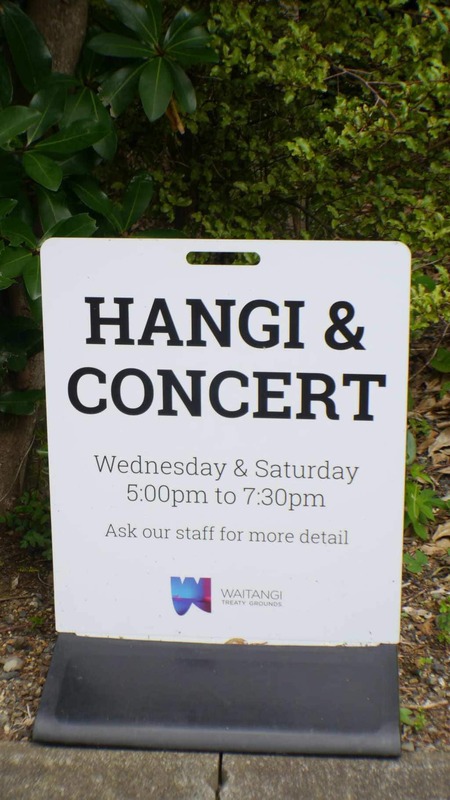 You can also purchase the tickets which include a cultural performance or join one of their Hangi dinners.